On Sale Now! Free Shipping Included! Save 3% on the Gator G-LCD-TOTE60 Padded Nylon Carry Tote Bag for Transporting LCD Monitors and, 60'' Screens by Gator at IGWT. MPN: G-LCD-TOTE60. Hurry! Limited time offer. Offer valid only while supplies last. 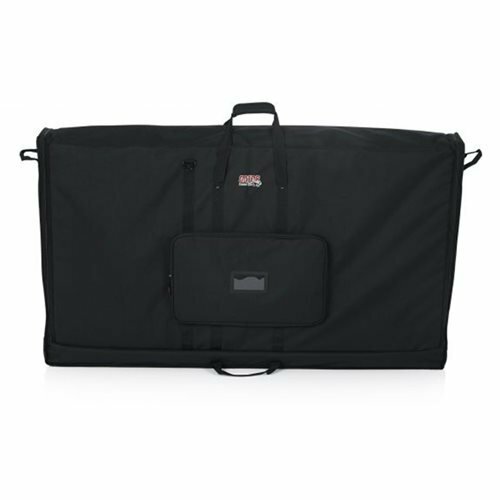 The Gator 60″ LCD Tote bag is a heavy-duty nylon bag with soft tricot fabric lining, ideal for protecting and transporting LCD screens up to 60″. The Gator 60″ LCD Tote bag is a heavy-duty nylon bag with soft tricot fabric lining, ideal for protecting and transporting LCD screens up to 60″. this LCD Tote bag has 25mm of thick PE foam and a reinforced screen shield, ensuring 360-degree protection. The LCD Tote bag features 25mm thick PE foam padding on all sides and a reinforced front for additional protection. The LCD Tote utilizes a dual zippered design for easy loading and unloading. Store cables and accessories in the large exterior storage pocket with a clear vinyl window for a business card or ID. The LCD Tote series includes a durable nylon web carry handle and an adjustable, removable padded shoulder strap for a comfortable, secure solution. Fits screens up to 60"